Just a reminder, Sunday is Father’s day and there is a classic road racing event in Harlem. 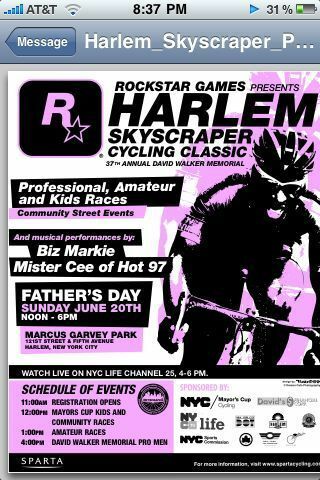 Rockstar Games, the venerable publisher of the Grand Theft Auto series and Red Dead Redemption, is proud to present the 37th annual Harlem Cycling Classic. Founded by the late David Walker, an NYPD Community Affairs Officer, the event celebrates health, fitness, and the vibrant Harlem neighborhood. The day begins with races for amateurs and professionals alike, as well live performances by DJ Lance Rock of Yo Gabba Gabba! and hip-hop icons Biz Markie and Mister Cee. Adding to the atmosphere will be New York Cityâ€™s celebrated Wafels & Dinges and Frites & Meats food trucks for all in attendance and Jumbotron screens highlighting the dayâ€™s events.